The process of injection molding is to use pressure to force molten raw material into a mold, where the cavity/cavities inside the mold form the raw material into the desired shape. The raw material will then solidify inside the mold cavity and the finished part is then ejected from the injection molding machine. RMC Plastics has compiled some useful information to help you become more familiar with the types of Molds, Mold Classes and Thermoplastic resins and Additives we utilize in this process to produce quality and cost effective solutions for our customers. Prototypes: A prototype mold is a low production mold that is used to prove out a concept. These molds are less expensive due to their materials and they lack durability. Cavitation: A mold can have either a single cavity to produce one part per cycle or multiple cavities to produce several parts per cycle. A single cavity mold will be the most cost effective in terms of the cost to product the mold, but overall cost of producing parts will be more expensive because each cycle of injection molding using a single cavity mold will only produce on mart. A multi cavity mold is typically larger and more complex, therefore more expensive than a single cavity mold, but the overall cost of the finished part will be reduced due to increased production of numerous finished parts per cycle of injection molding. The customer should consider both factors when determining single cavity over multi-cavity molds. Family Mold: A multi-cavity mold can be used to create a series of different parts within the same mold. Cold Runner Molds: Cold runner molds are traditional molds that utilize sprues, runners and gates into the part. This is typically the least complicated form of a mold. The sprue and runners do result in excess material used to make the part/parts, which may be re-ground and re-processed for future use. Dealing with more advanced, high-cost materials such as engineering and medical grade resins or the inability to use regrind in your application may lend itself to using a more efficient hot runner mold for your project. Insulated Molds: Insulated Runner tools resemble more traditional cold runner molds but utilize cartridge heaters or other methods of heating to form a surrounding layer of molten resin, forming an insulated “cull” to create a similar effect to a hot runner system. This approach is less expensive than using a hot runner which requires a temperature controller and also has the benefit of allowing for faster color and material changes. However insulated runners are not suitable for all types of materials and typically do not work well with more demanding engineering grade resins. Two / Three Plate Molds: Three-plate molds are cold runner tools, but by adding a third plate to the runner system, you are able to locate your injection point into virtually any location on the tool. This is usually less expensive than adding a hot runner system, however this type of mold often has large and unwieldy runners, which can be more difficult to automate. Unit Die: A unit die consists of a standard-sized mold base frame, with hand-loaded core and cavity sets. They are typically small, fast, flexible and cheaper to create because you don’t have to make separate mold bases for each tool. However unit dies can limit the amount of customizations you can make on a tooling project due to size and space constraints. They are better suited for less robust applications. General Specifications Common to All Class Molds: The customer is to approve the mold design before start of construction. Molds are to have adequate channels for temperature control. The customer name, part number and mold number should be on all molds. Molds and large components should have adequate provisions for handling, i.e., eyebolt holes, prybar slots, etc. SPI Class 101 Molds: Built for One Million or More Cycles. Built for extremely high production. This is the highest price mold and is made with only the highest quality materials. Mold base should be a minimum hardness of 280 BHN. Molding surfaces (cavities and cores) must be hardened to a minimum of 48 Rc. All other details, such as slides, heel blocks, gibs, wedge blocks, etc., should also be of hardened tool steels. Ejection should be guided. Slides must have wear plates. Temperature control provisions to be in cavities, cores and slides wherever possible. SPI Class 102 Molds: Built for no more than one million cycles. Medium to high production mold, good for abrasive materials and/or parts requiring tolerances. This is a high quality, fairly high priced mold. This mold is identical to the Type 101 with the following items not required: guided ejection, hardened slide wear plates, plated water channels, and, wear plated cavities. This tool is a medium to high production tool that is good for abrasive materials and/or close tolerance products. SPI Class 103 Molds: Built for Under 500,000 Cycles. Medium production mold. This is a very popular mold for low to medium production needs. Most common price range. Mold base should be a minimum hardness of 165 BHN. Cores and cavities must be 280 BHN or higher. SPI Class 104 Molds: Built for Under 100,000 Cycles. Low production mold. Used only for limited production preferably with non-abrasive materials. Low to moderate price range. Mold base can be of mild steel or aluminum. Cores and cavities can be of aluminum, mild steel or any other agreed upon metal. SPI Class 105 Molds: Built for no more than 500 cycles. Prototype only. This mold will be constructed in the least expensive manner possible to produce a very limited quantity of product. The mold base may be constructed from cast metal or epoxy or any other material offering sufficient strength to produce the minimum prototype pieces. This tool is only for prototype purposes only. Polystyrene: An economical and fairly rigid plastic. Used in both high volume production and prototyping. Seen in a wide variety of products, from molded packaging materials, aerospace and CD cases. ABS (Acrylonitrile Butadiene Styrene): A strong, rigid and tough material with good electrical properties and excellent chemical resistance. Both impact resistant and lightweight. Utilized in automotive, industrial, safety and consumer products. Polypropylene: An economical and rugged material that can be both flexible and tough. Great fatigue resistance and can be produced in a variety of colors. Utilized in automotive, medical, packaging, wire insulation and where plastic hinging is required. Polyurethane: A resilient material with durability, toughness, abrasion resistance and resistant to flex fatigue. Good electrical characteristics, resistant to solvents and having a high load bearing capacity. Utilized in electronics, transportation, industrial, construction and consumer parts. Acetal: A tough material with good heat resistance, rigidity and resistant to chemicals. Utilized in industrial, automotive, plumbing fixtures, telecommunications and consumer products. LDPE (Low Density Polyethylene): Good tensile strength and ductility with excellent resistance to alcohols, bases and acids. LLDPE (Linear Low Density Polyethylene): Extremely tough, flexible and higher tensile strength than LDPE. Utilized in industrial packaging, consumer goods, food packaging and pipe. HDPE (High Density Polyethylene): A lightweight material with excellent durability, high tensile strength, corrosion and chemical resistant. HDPE has high impact resistance and low moisture absorption. Widely used in industrial, medical and consumer industries. UHMW (Ultra High Molecular Weight Polyethylene): An extremely tough material with high abrasion and wear resistance. Popular for countless industrial applications that require durability, low friction and chemical resistance. Polycarbonate: Combines outstanding strength, scratch resistance, durability and good mechanical properties with good optical properties. Used in eyeglass lenses, headlight covers, goggles, CD, food and beverage containers. Nylon: PA 66, 6, 6/12 and 666. A very durable material that is resistant to abrasion, tough, high impact resistance, chemical resistant and UV resistant. Utilized in consumer goods, recreation, industrial, medical, automotive, military and electronics. PEI: Polyetherimide is an amorphous engineering polymer capable of extreme temperature use. Polyetherimide provides outstanding electrical properties with stability over a wide variance of frequencies and temperatures. PEI is inherently flame retardant, and is also a low smoke generating polymer. PEEK: Superb mechanical properties and is highly resistant to chemicals and thermal degradation. It holds up well against high temperatures and long-term liquid submersion, and is very durable in harsh environments. PEEK makes an excellent reinforcement material, providing great tensile strength and low weight. Polysulfone: A semitransparent, heat-resistant, thermoplastic offering excellent mechanical, electrical and chemical resistance. Polysulfone properties remain relatively consistent over a broad range of temperatures, from -150°F to 300°F, and this material is suitable for applications where autoclavability is required. Polyester: Combines high heat resistance, good impact strength, chemical resistance, good electrical properties, toughness, dimensional stability with flame retardant properties. Utilized in electronics, automotive, industrial and aerospace industries. Fillers: Additions to the base thermoplastic resin to aid in increasing both stiffness and strength. The most common type of fibers added for strength would be carbon and glass. Glass-reinforced plastic is more commonly known and marketed as fiberglass. 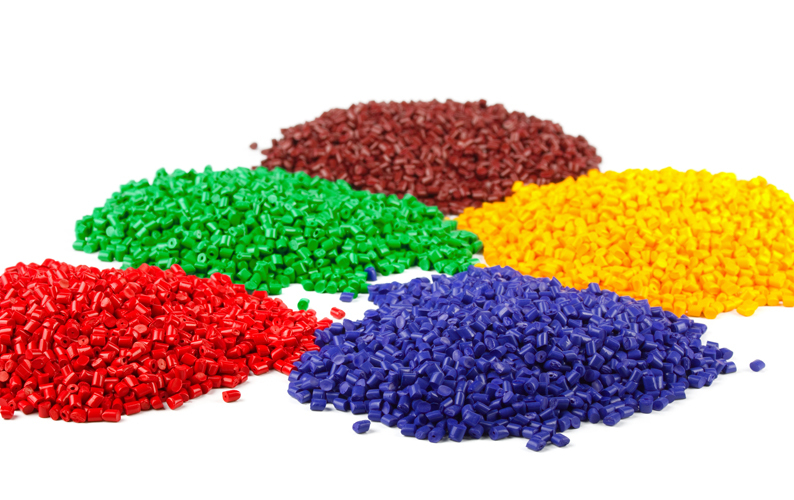 Colorants: Add color, patterns and effects to plastic products. UV Stabilizers: Used for the protection of the resin’s mechanical properties by absorbing selective UV rays resulting in less degradation. Lubricants: Used for easier molding or for increased adhesion and viscosity of the molded parts. Fibers: Like Fillers, used to increase strength and stiffness. The most common type of fibers added for strength would be glass and carbon. Glass-reinforced plastic is more commonly known and marketed as fiberglass/glassfilled. Flame Retardant: A variety of chemicals that can be added to resins to eliminate its tendency to burn. For polyethylene and similar resins, chemicals such as antimony trioxide and chlorinated paraffin are useful.